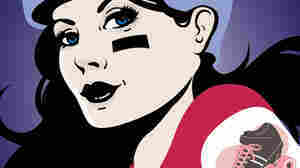 August 31, 2010  Alex Cohen may be a public radio reporter by day, but by night she goes by her roller derby name — Axles of Evil. Cohen has joined forces with fellow L.A. Derby Doll Jennifer "Kasey Bomber" Barbee to write Down and Derby, an insider's guide to a rough-and-tumble sport. August 30, 2010  In the 1980s, Katherine Hamilton was a track star with big dreams. A heptathlete attending college on a full-ride athletic scholarship, she was training hard without steroids but "watching everybody else go forward, year after year after year." 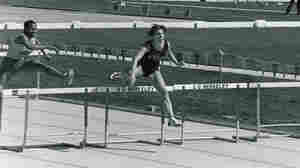 As performance-enhancing drugs took over her sport, she decided to sign away her scholarship and leave school. August 28, 2010  You'd think times would be pretty tough for the last-place Pittsburgh Pirates, but the worst team in baseball has figured out a winning strategy for making money. August 27, 2010  Washington Nationals pitching phenom Steven Strasburg is out for the season and could need reconstructive surgery for a torn ligament in his arm. As NPR's Mike Pesca reports, the injury is raising questions about the Nats' decision to bring the much-hyped 21-year-old rookie to the majors so soon. August 27, 2010  The season is over for the Washington Nationals' star pitcher Stephen Strasburg. He's expected to undergo Tommy John surgery to replace a torn ligament in his right elbow. If all goes well, he could be back in pitching form in 12 to 18 months. August 27, 2010  Widely considered one of the greatest tennis players of all time, Andre Agassi admitted in his autobiography that he hates tennis, "with a dark and secret passion." Always has. He spoke to Terry Gross last November about what he calls the "contradictions" at the core of his life. August 27, 2010  The Washington Nationals say pitcher Stephen Strasburg has a torn elbow ligament and probably will have Tommy John surgery, a replacement procedure that is likely to keep him out of action for 12 to 18 months. August 26, 2010  Golfers have a seemingly unquenchable desire to spend hundreds of dollars in pursuit of the majestic tee shot, dead-eye putting skills, and a score at least in the vicinity of par. Now, advanced tools -- digital and otherwise -- have become a regular part of their quest. August 26, 2010  Sometimes parents can't tear themselves away from work to see their kids' sporting events. One company is allowing parents to be involved from their smartphones or laptops. Youth Sports Live has struck deals with dozens of Little Leagues to install webcams at baseball and softball fields. For $14.95 a month, parents get streaming access to games. August 25, 2010  Frank and Jamie McCourt's multimillion-dollar divorce case is about to play out in a Los Angeles courtroom. But beyond the damage the McCourts may do to each other, some worry more about what the marital war may do to their most prized possession: the Los Angeles Dodgers. August 25, 2010  For a long time the running back was the face of many NFL teams. Senior writer Tim Layden of Sports Illustrated talks to Linda Wertheimer about the diminished role of running backs in the NFL. Layden argues that the NFL has become a quarterback's league, with many coaches emphasizing the passing game. August 22, 2010  For many, the countdown to the start of a new NFL season begins the second after the final whistle blows in the Super Bowl. For the rest of us, football may be only as appetizing as the seven-layer dip we get to eat while watching TV. Guest host Rachel Martin previews the season with Washington Post sports columnist Mike Wise, including the return of quarterback Brett Favre to the Minnesota Vikings. Feds Cry Foul On Roger Clemens; Is His Game Over? August 21, 2010  Roger Clemens struck out 4,672 batters in his career, but mighty Clemens has struck out in the eyes of the federal government. He was indicted this week on charges of lying to Congress when he testified that he had not used performance-enhancing drugs. So, does his future lie in Cooperstown or Leavenworth? Host Scott Simon talks with NPR sports correspondent Tom Goldman about the indictment.